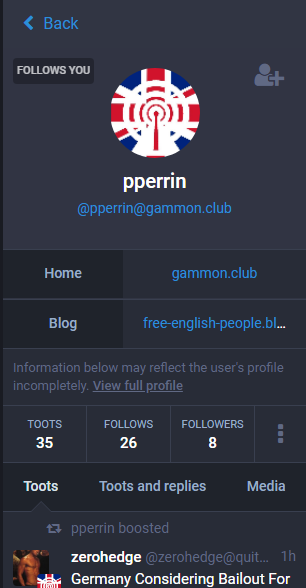 Free People of England: Gammon.club - part of the alternative Twittersphere 'Mastodon'. Gammon.club - part of the alternative Twittersphere 'Mastodon'. Getting off to a flying start. 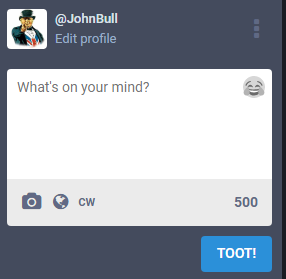 Using Mastodon is quite like Twitter. The default web interface for Mastodon is very like Tweetdeck - with columns of messages selected for various reason. You can favourite, reply or boost messages (Messages are referred to as'Toots' rather than Twitters 'Tweets') and you can follow other users, and they can follow you. Twitter has around 350 million users, the Mastodon federated network has a bit over 2 million. The biggest difference is that Twitter is run by @jack - he is the god of all Twitter. Mastodon is a federation of many smaller instances, to the user it looks pretty much the same, but each instance has its own 'jack' who administers it and different instances may have different rules. This has pros and cons, one is that you can have a jack that is fare better than @jack, the other is that you con have a jack that is far worse than @jack - but you can move instances pretty easily if it all goes sour, you aren't completely cast into the wilderness! 1) Chose an instance - maybe John Bull's Gammon.Club! This is like an email domain, the bit after the @ in your email address - @gmail.com, @yahoo.com, @ etc. This will be your local instance and be part of your id. I am @JohnBull@gammon.club (n.b. yup two '@'s in there, and I don't think capitalisation matters, I must check!). Users/toots on your home instance get special treatment/priority so it is best to choose one populated by users who will tend to be particularly interesting to you. Just as you can have more than one email address - work, gmail, yahoo etc you could have accounts on several instances, but we are staring with your first. Once you have chosen an instance and created an account (there maybe email confirmation etc) you are good to go. So login to your new account, update your profile with a picture/avatar, a few words about yourself (whatever you want to say/disclose!) maybe other links (blog, facebook etc), you will already be setup to follow the instance administrator (your own local jack) and get started. The first column has a useful toolbar and search at the top and is where you type your new toots. The second column 'Home' lists the tweets of those people you follow (like the main twitter time line). The third column 'Notifications' shows events that specifically affect you - follows, boosts, replies etc. The fourth 'Getting Started' column can change what it shows by clicking the links or by using the toolbar in the fist column. The first icon/buttons is 'Getting Started' and shows the 'gettng started' column with it's useful links. The second icon is 'Local Timeline' which shows all the toots of all the users on your home instance. The third icon is 'Federated Timeline' which is the same for all users on the instance - it shows all the toots of all the people on your instance and the toots of the people followed by people on your instance. 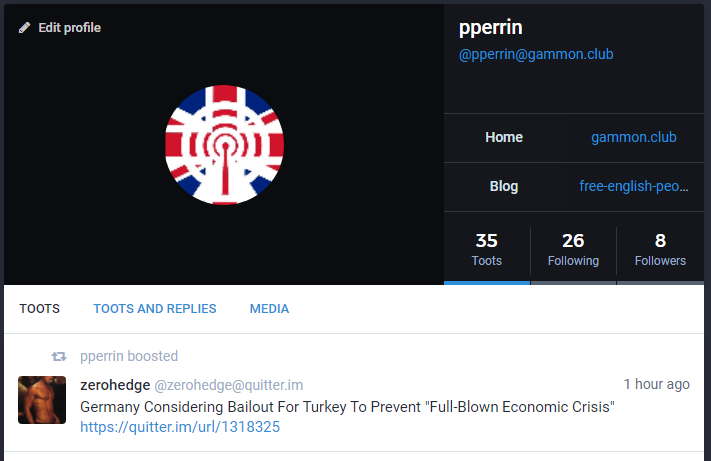 So as I follow @zerohedge@quitter.im all of his public tweets show in my 'Home' timeline, but in the 'Federated Timeline' too. The next two icons don't change the fourth column - the first is 'settings' and the last is 'logout'. 5) Finding people to follow. 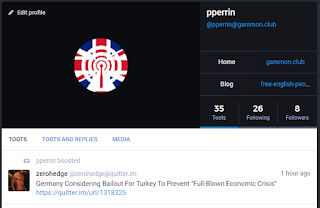 Clicking on a toot can take you to the posters profile, their home server, their other threads etc - if you see a tweet that you like then check out that persons own timeline - see who they are talking to, follow anyone who looks interesting. 6) Anatomy of a Toot. 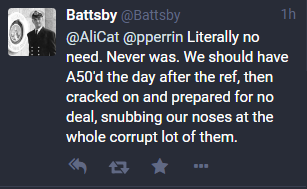 Posted by @Battsby - an account on the same server, otherwise it would be shown as @Battsby@gammon.club. Clicking the @Battsby would show his profile (in the 4th column)., clicking on @AliCat or @pperrin would show you to theirs. Clicking on the time (1h, here meaning 1 hour ago) would open the toot and its thread in a new window. Clicking in the text of the tweet will display the thread the toot is part of.. The double left arrows allows you to 'reply' to the toot. The recycle arrows allow you to boost (retoot) the message to people who follow you. The star favourites the toot. The ... opens more options - which are text not icons so don't need explaining here! 7) Anatomy of a new Toot. Unlisted - does not appear in instance or federated timelines. Followers - Unlisted and can't be boosted/retooted for others to see. Direct - To specified users only. The number (here 500) is the number of characters you have left to use! 8) Anatomy of a Profile. If you click on an users name @user@home-instance you will get a summary view of their profile in the fourth column. vis. I use JohnBull for admin, pperrin for chat this is the @pperrin@gammon.club profile viewed from another instance. But a nice easter egg is if you click on the avatar image... it will take you to the profile page on the home server vis. The fields here are, again pretty self explanatory. But give you a page full if information at a time rather than it being squeezed into a column(!). And as this page is from the home server all the info will be up to date immediately. Just as quick side note - if you see a toot you want to reply to, I would suggest you first click on the '...' and then 'expand this status' - this will display the entire thread in the fourth column - and seems to do a better job of pulling in comments from other instances to the thread. Toot from any page - drag this to your bookmarks bar - it assumes you are on Gammon.club - if you are on a different instance, edit it to change the url. A great help thank you .... except what's a 'home instance'? Sorry - missed the notification of a comment! Mastodon is many little twitters all joined up - the 'home instance' is the one you've joined and post from -- but your posts can be seen on any instance.